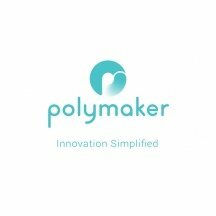 Polymaker is a brand that offers filaments for PLA 3D printers, flexible and polycarbonate, this brand is very committed to the innovation, quality and durability of its products, and Polymaker has in fact set up an 8-step monitoring process of its filaments in order to guarantee the best quality product on the market. The polymaker brand offers 3 product ranges, PLA PolyMax which is much stronger than the classic PLA and 20% stronger than ABS and this range allows you to produce high quality prints thanks to its high mechanical properties. PLA PolyPlus is a top of the range PLA thanks to its "Jam Free" technology which prevents the nozzle of your 3D printer from clogging. With its high-quality filaments Polymaker wants to offer you the best possible printing experience but also guarantee hassle-free 3D printing. To conclude is the PLA PolyFlex that allows you to produce high-quality prints, these flexible filaments allow you to push the limits of your imagination and guarantee you a result even closer to your expectations. Finally polymaker also offers a Polymaker PC-Plus range which guarantees you 3D prints that are much stronger than PLA prints or those based on ABS. Polymaker has a production plant in China, specifically in Shanghai while its logistics centre and offices are located in the Netherlands. Finally Polymaker has a warehouse in New York to distribute its filaments for 3D printers all around the world. With regard to PLA filaments from Polymaker, they are odourless when printed, guaranteed for food contact but also completely biodegradable. Polymaker also offers various shades that allow you to produce objects that let in as much light as you wish. Polymaker also supplies a booklet in each of your boxes so that your printing goes smoothly. Polymaker filaments are available in 1.75mm and 2.85mm diameter. PolyMax white PLA from Polymaker is 9 times more durable than conventional PLA and 20% stronger than ABS. With its superior mechanical properties, PolyMax lets you produce excellent-quality prints. Comes in a 750g spool with sachet of desiccant and instructions for use. PC-Plus transparent polycarbonate from Polymaker offers excellent print quality thanks to its heat resistance. Parts don’t become detached during printing (no warping) and are very durable and robust. Comes in a 750g spool with sachet of desiccant and instructions for use. We recommend you use Buildtak film when printing. Polyflex white filament from Polymaker is a very flexible material that’s easy to print. Polyflex has great elasticity and excellent breaking strength for a variety of applications. Comes in a 750g spool with sachet of desiccant and instructions for use. Polywood filament from Polymaker is an imitation wood. Exclusively made up of polymers, Polywood produces an amazing result while avoiding nozzle clogging. Comes in a 600g spool with sachet of desiccant and instructions for use. Polyflex black filament from Polymaker is a very flexible material that’s easy to print. Polyflex has great elasticity and excellent breaking strength for a variety of applications. Comes in a 750g spool with sachet of desiccant and instructions for use. Polyflex orange filament from Polymaker is a very flexible material that’s easy to print. Polyflex has great elasticity and excellent breaking strength for a variety of applications. Comes in a 750g spool with sachet of desiccant and instructions for use. Polyflex yellow filament from Polymaker is a very flexible material that’s easy to print. Polyflex has great elasticity and excellent breaking strength for a variety of applications. Comes in a 750g spool with sachet of desiccant and instructions for use. PC-Plus white polycarbonate from Polymaker offers excellent print quality thanks to its heat resistance. Parts don’t become detached during printing (no warping) and are very durable and robust. Comes in a 750g spool with sachet of desiccant and instructions for use. We recommend you use Buildtak film when printing. PolyMax black PLA from Polymaker is 9 times more durable than conventional PLA and 20% stronger than ABS. With its superior mechanical properties, PolyMax lets you produce excellent-quality prints. Comes in a 750g spool with sachet of desiccant and instructions for use. PolyMax blue PLA from Polymaker is 9 times more durable than conventional PLA and 20% stronger than ABS. With its superior mechanical properties, PolyMax lets you produce excellent-quality prints. Comes in a 750g spool with sachet of desiccant and instructions for use. PolyMax orange PLA from Polymaker is 9 times more durable than conventional PLA and 20% stronger than ABS. With its superior mechanical properties, PolyMax lets you produce excellent-quality prints. Comes in a 750g spool with sachet of desiccant and instructions for use. PolyMax yellow PLA from Polymaker is 9 times more durable than conventional PLA and 20% stronger than ABS. With its superior mechanical properties, PolyMax lets you produce excellent-quality prints. Comes in a 750g spool with sachet of desiccant and instructions for use. PolyMax Blue Turquoise PLA from Polymaker is 9 times more durable than conventional PLA and 20% stronger than ABS. With its superior mechanical properties, PolyMax lets you produce excellent-quality prints. Comes in a 750g spool with sachet of desiccant and instructions for use. PolyMax grey PLA from Polymaker is 9 times more durable than conventional PLA and 20% stronger than ABS. With its superior mechanical properties, PolyMax lets you produce excellent-quality prints. Comes in a 750g spool with sachet of desiccant and instructions for use. PolyMax green PLA from Polymaker is 9 times more durable than conventional PLA and 20% stronger than ABS. With its superior mechanical properties, PolyMax lets you produce excellent-quality prints. Comes in a 750g spool with sachet of desiccant and instructions for use.